China May Drop 9 Crimes From List Of Death Penalty Offenses : The Two-Way The move appears to be part of a trend to reduce the use of the death penalty in a country that still executes more people than any other. Police officers stand guard in front of the Hefei City Intermediate People's Court in China's Anhui Province. 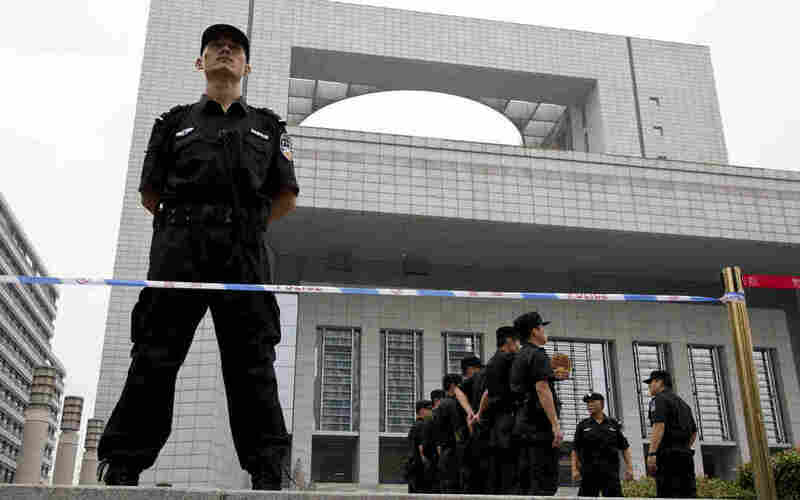 Chinese lawmakers are considering removing nine crimes from eligibility for the death penalty. A draft amendment to that effect went to the Standing Committee of the National People's Congress in Beijing this week. It appears to be part of a trend to reduce the use of the death penalty in a country that still executes more people than any other. Legislators are considering striking the use of the death penalty for such offenses as weapons smuggling, counterfeiting, forcing others into prostitution, and spreading rumors to mislead others during wartime, according to the New China News Service. The maximum punishment for those crimes would become life imprisonment, though it was not immediately clear how many people are actually executed for those offenses now. In 2011, China dropped the death penalty for 13 non-violent, economic crimes, including smuggling of culture relics as well as gold and silver. That move, though, was seen as largely symbolic. Fifty-five crimes are still punishable by death. The move to reduce use of the death penalty is driven by concerns about miscarriages of justice in a legal system that has been known in the past for forced confessions and a 99-percent conviction rate. The number of people executed in China remains a secret, but human rights activists believe it is in significant decline. In 2002, China executed about 12,000 people. The Duihua Foundation, a human rights group based in San Francisco, estimates the number last year was around 2,400.